Using the TDA7275A linear integrated circuit designed in a minidip plastic package can be designed a very simple speed regulator electronic project that can be used for speed regulation of small DC motors . 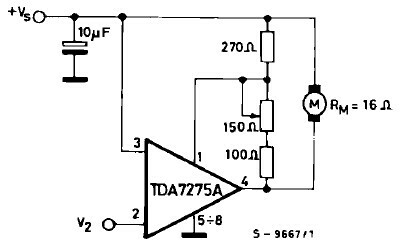 TDA7275A DC speed controller project is intended for use as speed regulator for DC motors of record players, tape and cassette recorders. This DC motor speed controller circuit project can provide a maximum output current of 1.5 amperes. Supply voltage range that is accepted for this DC motor speed regulator project is between 8 and 18 volts . V2 is typically 1.5 volt for Motor ”Run” (Acc. Following data or open) and 1 volt for Motor ”Stop” (Acc. Following data or grounded).